Some friends and I are working with the guys at Beavertail Skiffs on a new project and we'll be heading to Key West early next month with their newest skiff. The Vengance is a fantastic flats boat that has all of the performance and quality of other hulls costing at least $10,000 more. We'll be at the Hurricane Hole Marina on Stock Island from April 3rd to the 9th. Mark Fisher, Beavertail's owner, will be there until Wednesday the 7th so you'll also get a chance to meet him in person and test drive the skiff for yourself. We'll be out on the water for most mornings and afternoons but should be back for Happy Hour so that'll be the best time to stop by the marina. If you happen to be in the Lower Keys and want to see the boat in person just shoot me an e-mail at gmckee1@hotmail.com. Actually it was in my neighor's driveway this morning. It came out of our backyard wetland after yesterday's record setting monsoon rainfall. Of course I had to study it much closer. And then it bit my face off. Matlacha Pass is loading up with redfish right now that our Winter From Hell is finally over. We're still at least ten degrees below normal temperatures but the reds don't seem to mind. I stuck to sight casting on my trips this week and managed to pull in a couple decent fish, including this 22 incher pictured here. Fly fishing has been especially tricky since the water is still perfectly clear so casting shrimp works much better. Several guides have reported catching over a dozen fish in the deeper holes out in Pine Island Sound by blind casting and soaking cut bait. I don't use that method too often but more power to them for making it work so well. Anything to get the anglers back to Southwest Florida after all we've been through so far this year. This is Beavertail's new Vengance skiff and it's easily the best looking flats boat I've ever seen. 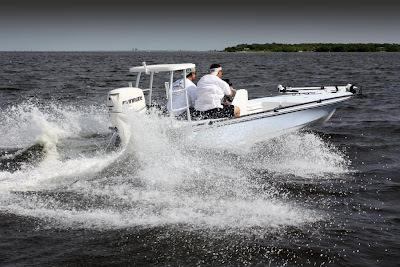 It's a complete departure from their previous line of skiffs and totally new from bow to stern. The best part of all is the price. The Vengance shown here lists at $27,000. That's easily $10,000 less than a comparable skiff from Maverick or Hell's Bay. I had a great time at the show and the highlight was spending an hour chatting with Beavertail's owner Mark Fisher. He's a great guy and very accessable to anyone interested in his boats. You can find a lot more information about the Vengance and the company, now located here in Florida, by going to their website at www.beavertailskiffs.com.